After working in the garden or mowing the lawn, you'll want to pull up a tree stump and have a pleasant nap. 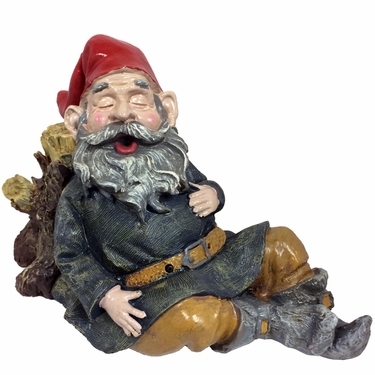 You'll be inspired to do just that with our Snoring Merlin Gnome! Motion-activated design gives off loud snoring sounds when someone walks by, or sleeps silently when turned off. Fun both ways! At Garden Fun, we have a huge assortment of delightful garden gnomes that will instantly transform their surroundings into a magical place. The perfect addition to your flower or vegetable garden, this jolly sleeping gnome will actually snore when anyone walks by, as they have a built-in battery-powered motion sensor.